Natural history: Tenellia sp. #22 is a moderately rare aeolid that occurs in moderately protected to moderately exposed rocky habitats from < 1 to 34 m (< 3 to 110 ft). It lays a white egg mass of about one whorl. 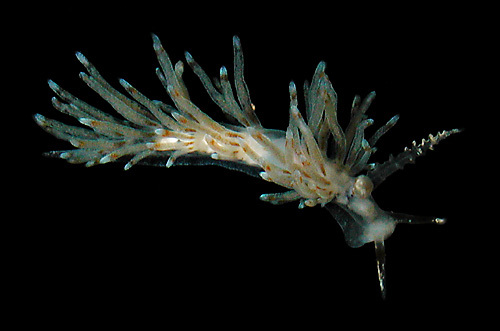 Taxonomic notes: It was first recorded in Hawaii from Midway Atoll by Terry Gosliner and PF in June, 1993 and was formerly placed in the genus Cuthona. Photo: CP: 6 mm: Mala Wharf, Maui; April 27, 2005. Note 1: The Midway animal (see photo) is atypical in having faint patches of white pigment on the notum and the central portions of the cerata. However, it appears to group more closely with this species than with C. pinnifera due to its slender cerata and other aspects of its coloration. Of course, there's some chance that it could ultimately fall on the "other side of the split." Also, we might wind up "re-lumping" the two species if future DNA work should falsify our current interpretation.